You’ve heard it all - the Samsung Galaxy Note III was first said to feature an unbreakable display, then it was said to have a display larger than six inches, but others claimed it’d be 5.7 inches and still breakable. Who got it right? It might just turn out that everyone was right. The Samsung Galaxy Note III might end up launched in four very different models, according to Korean publication ET News. Surprised, shocked? Well, don’t be. Remember, we’re talking about Samsung here, the same company that iterates on the design of its flagship Galaxy S4 to eternity with all sorts of models. Here, there is a slight difference though as we are not talking about different models, but about a single one - the Note III. Model 1 will have the following characteristics: Premium materials, 13-megapixel camera, unbreakable AMOLED screen, sold in limited amounts. Model 2 will have a plastic body, 13-megapixel camera, and regular AMOLED display. Model 3 will also have a plastic body and 13-megapixel camera, but feature an LCD screen. Model 4 finally will be the cheapest made out of plastic with 8-megapixel camera and an LCD display. If true, you definitely wouldn’t be able to complain about lack of choice. Keep in mind that none of this is official yet, let’s keep our fingers crossed model 1 really exists and Samsung unveils it at IFA 2013 this September. That is definitely one way to piss your customers off...."We made the product you all were asking for, but we're only offering it in limited quantities. You can still buy the other versions of our product though." I doubt they have the manufacturing capacity yet to supply unbreakable screens for millions of devices. They probably want to release ADN unbreakable screen before Apple patents the concept. Here, let me guess. Number 1= Note III Active Number 2= Note III 'Normal' (Yes, normal!) Number 3= Note III Duos Number 4= Note III Mini...shouldn't there be more?? This is crazy. This is the worst rumor yet. Model 1 is the ONLY way to go. 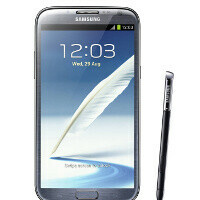 The Note III Mini would just be a Galaxy S 4 with a S-Pen. Well, judging from what came with the S4, i won't be surprised to see this rumor come to life! Note 3 Octa Note 3 S pro 800 Note 3 mega mini Note 3 mini mega rugged Octa active. The most non sense article from this site!! The more and more I hear about Key Lime Pie, the more I'm losing interest. All signs point to the fact that it's stripped down to work on the lowest specs possible. If there are any new features, it'll work through apps and thus must be coded to work for the lowest common denominator, killing optimization for higher end phones... Well, that's IF the rumors are true -- and the reasoning makes sense. If it does run better on low spec phones, then it'll be great for high end ones as well. I'd love the extra speed, smoothness, and battery life. Limited edition will get first IMO.. If anything it will depend more on the carrier than the model. But looking at the differences between the models, the only changes is the screen type and camera resolution, so there shouldn't be a lot of difference in the software. Model 1 is Note 3 Active? They better not do this. ...rrrright. Wonder why they are replacing their old Samsung phones with new ones then when it's time for a change. Anger management? Meh. I suspect you are seeing Sammy's plans for extending sales of the Note III by offering different variants. Apple is trying a similar approach with the iPhone. How about a Note III Mini? 4.8 or 5 inch display!? LOL! 5 inches? Get a GS4. GS4 has all of the features of Note 2 except stylus. I think he is mocking Samsung because between the gs4, gn3 and gTabs they are making well over a dozen different devices and doing exactly what Sammy fans were laughing at HTC for doing last year, only taking it up to the next level. This is good. This is choice. Model 1 seems to be the best but will probably be the most expensive. Some people might want a Note 3 but will want to spend less money. This is just like computers. Same model but different configurations with different prices per specs. Agreed, I really don't see a problem with this. If I'm willing to spend the extra money, I can get a better phone. Isn't that the way it works with most things in life?